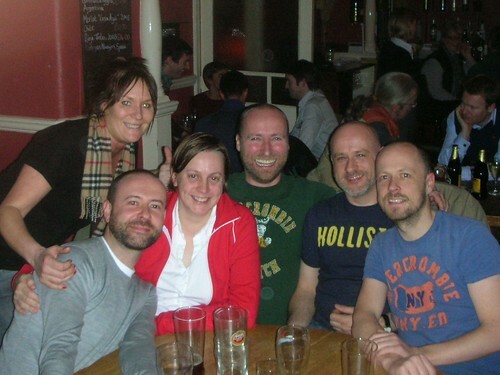 Last Thursday Stu, Sam, Andrew, Tim and I went to the Hemingford Arms in Islington to have a bash at their pub quiz. It was a fun night and what’s more we won. £40. In fact we won by a long chalk. The exact term they used was “runaway winners”. So we might go back. The questions were fairly straightforward but fun all the same. Examples were: “What three short abbreviations were associated with the Shaun of the Dead?” and “What comes next after: Lamb, Heggert, …?” There were also quite a few picture rounds (what skeleton is this, missing numbers, missing letters and Disney rabbits to identify). All good clean fun. Well, cleanish. Our team name? The Front-bottoms. Quite. More snaps here.